This is what America is all about. When the call came for men to stand up, and show up to be surrogate fathers to children who had none, men responded. 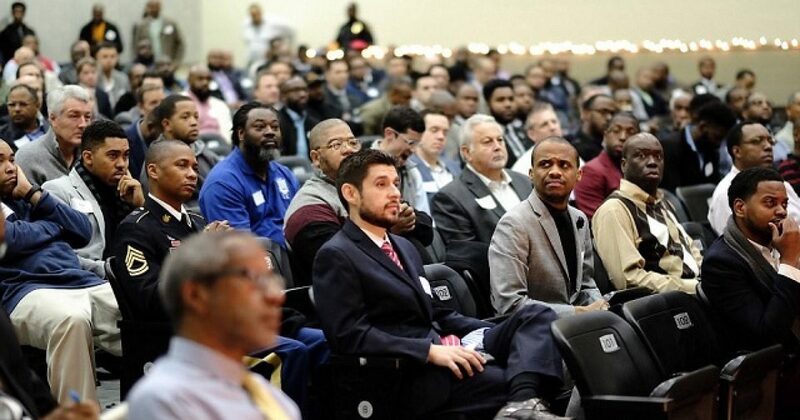 Some 600 men showed up to support students with absent fathers at a Texas middle school’s Breakfast with Dads event after just 50 volunteers were sought. This heartwarming act of kindness occurred last month at Billy Earl Dade Middle School in Dallas. The middle school has a population of nearly 900 students and about 90 per cent of those pupils come from low-income families. About 150 male students, ages 11 to 13, signed up for the Breakfast with Dads event, which was held on December 14, 2017, but Kristina Dove, the senior partner relations manager at Big Thought, a youth development nonprofit, wasn’t sure if every student would have a father present during the program. The rest is history, as men of all colors responded. The idea that six times the number of men responded speaks volumes. The photographer for this event deserve special praise for how she captured the emotions of the event. Meanwhile, at the Golden Globes, women bashed men. Because the Hollywood elitists live in their bubbles, as do their counterparts in DC. But this heartwarming outreach could have happened anywhere in this county. Because that’s what real men do.